Why all the fuss about corrosion in gun safes? Have you ever wondered why there are so many products on the market designed to slow or stop corrosion in a gun safe? Why is this such an issue? Most armorers will tell you if a gun is properly cleaned and oiled it should not rust. Have you ever seen anyone concerned about gun corrosion in a wood and glass display cabinet? Does the old shotgun above the fireplace rust? No! If properly maintained they do not. Yet in safes, corrosion is a hot topic. Is gun rust or corrosion a real threat or are they just trying to sell you an extra accessory that you don’t need? The gun safe industry creates and markets all these anti-corrosion products to mask the fact that it’s a real threat. Guns rust and corrode in safes. In fact, corrosion in gun safes occurs at a much higher rate and the corrosion process is much faster. To address these concerns, the industry produces and markets a wide variety of products designed to prevent or slow gun rust in safes. They’re asking the wrong questions! Why is corrosion such a problem in modern safes? That’s the big question that the industry fails to ask. The answer lies in the materials used to construct the modern gun safe and basic organic chemistry. Excerpt from SHOT Show presentation. Modern gun safes are built with a thin steel shell, lined with gypsum board (drywall) and then carpeted. To understand the corrosion issues you have to look at the chemicals contained in these materials and how they react. Formaldehyde is used in drywall manufacturing. It is a dispersing agent used in drywall slurry. These dispersing agents are called sulfonated naphthalene-formaldehyde condensates. As the term implies, these formulations involve a combination of formaldehyde and naphthalene. The agents vaporize in your safe, creating a potentially caustic environment for metal and wood. Museums ban the use of formaldehyde in areas where artifacts are stored. Formaldehyde is also in the adhesive used to attach the carpet interior in most safes. Sandvik laboratory test results for CH2O (formaldehyde) and carbon steel: corrosion rate over 1.0 mm/year. ~ Serious corrosion. The material is not usable. Sulfur is found in drywall particularly from China. Sulfur reacts with trace amounts of water (humidity) to form hydrogen sulfide and sulfuric acid. Pyrite (iron sulfide) also known as “fool’s gold” is a very common mineral. It is present in gypsum and mined to make drywall. There are small amounts of gypsum in the U.S. and much larger amounts in gypsum mined in China. The pyrite ends up in the drywall. While this is not a big deal when it comes to home construction, you do not want it in your gun safe. Pyrite (Iron sulfide) reacts with oxygen and water to form iron and sulfur in the forms of iron oxide-hydroxide (rust) and sulfuric acids. Sulfuric acid is particularly aggressive when it comes to corroding metal. This is a type of bacteria that eats metal. It lives on the pyrite in the drywall. It is this bacterium that breaks down pyrite into iron hydroxide and sulfur-based acids. However, it doesn’t stop there. Ferrooxidans will consume many other metals. Ferrooxidan bacterium is used in mining operations to strip metals in low-grade ore.
Next time you open a safe, see if you detect a slight earthy or sulfur smell. It’s there and gets stronger the longer the door has been closed. I have noticed it, particularly in cheap safes on the sales floor in some big-box sport discount stores. That smell is the above processes in action and it will cause gun rust very quickly. As you can see, there is very good reason for all the corrosion control products in the safe industry. Modern gypsum (drywall) based gun safes are corrosive. How did the gun safe industry end up producing a product that can destroy the very item it is designed to protect? It started in the late 1970s. Up until then, gun safes were based on the original design of Silas Herring. He used a sandwich design of thick outer steel, thin inner steel, and plaster or cement in the middle. This has been the standard fireproof safe design for over 100 years. In the 1980s the gun safe market started growing and as demand for safes grew, a bunch of new companies entered the market. To reduce costs and speed production, these new producers dropped the original Silas Herring design in favor of cheaper, lighter materials. They eliminated the thick outer steel. They eliminated the plaster or cement filler. The thin inner steel cabinet became the outside steel box. They lined this thin walled box with drywall then carpeted over it. This is the modern gun safe. If you have purchased a gun safe made after 1980 it is most likely a UL Class RSC. It is drywall based and subject to all the corrosion issues above. Your best defense against corrosion is still well-cleaned and well-lubricated firearms. It is important to open the door regularly and let your safe air out. This will reduce the corrosive sulfur compound buildup. Dehumidifiers slow the process by lowering humidity, but they don’t stop it. The interior of a gun safe can be removed and replaced with safer materials. Products like SBI Micore-300 can be used to replace the drywall. However, this is an extensive modification and will take some time and skill to properly fit and install the new fire board. How do you avoid all this? Do not buy a gun safe with drywall or carpeting. That eliminates just about every safe sold in America. Otherwise, Ft. Knox, Browning, American Security, and a few boutique producers offer safe models with the Herring double walled steel design. These models do offer some security and modest fire protection, and the inner steel will provide good corrosion protection. These safes start at around ,000and go up to 20K+. This brings up the following questions. Why buy a gun safe? The data suggests that common UL Class RSC safes offer little in the way of security or fire protection. So what do you do? How do you protect your investment? Shy of spending north of , consider steel cabinets. They are just as secure, and most likely offer the same fire protection of a big heavy drywall based UL – RSC gun safe. There are other advantages of eliminating the drywall from gun cabinets. Weight, going lighter is better. It is easier and certainly gives you more flexibility in how and where you store and secure your firearms. Consider SecureIt Tactical Model 52. This gun cabinet that will provide a strong theft deterrent, is lightweight and easily concealable. Perhaps best of all, it won’t corrode and destroy the very things its meant to protect. The all steel design of our gun cabinets is far safer for your firearms in terms of corrosion. Smaller steel gun cabinets can be located throughout a home, allowing you fast access to locked firearms in a crisis situation. Smaller lighter modular cabinets can be secured anywhere in a home, condo, cabin or RV. Modular cabinets can bolt together and expand to meet growing needs. Firearms storage is going to change. The gun safe industry produces and markets a product based on the illusion of security. Their stated gun capacity is outright deception. They are not fireproof and the materials used inside a safe promote gun corrosion. You can fool some of the people some of the time. Eventually, it all catches up. That is what is happening now. 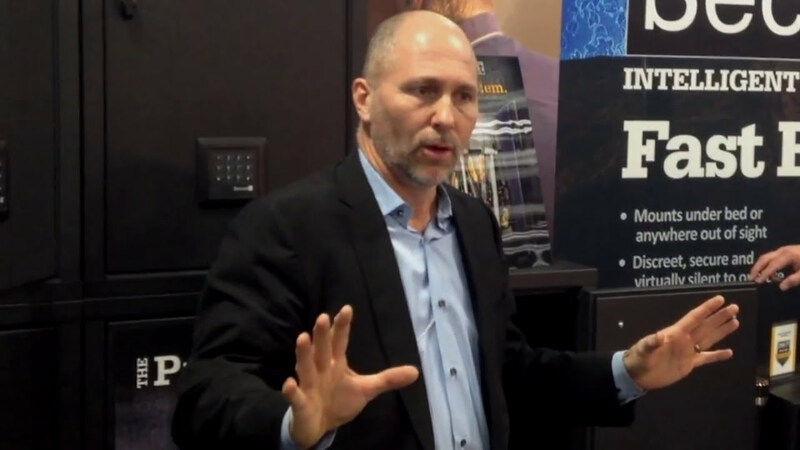 SecureIt and CradleGrid technology have taken aim at the gun safe industry. SecureIt is the leading supplier of weapon storage systems to the US Government. We have revolutionized military armory function. We will do the same for home firearms storage. SecureIt has taken the leadership position in modern firearms storage, and things will change quickly over the next few years. Will the gun safe industry be able to adapt? « Gun Safes: Ratings and Certifications Are you being bamboozled? Modular, thin-skinned, super light weight cabinet could be opened with a screwdriver; or picked up and hauled away easily. Thank you for taking the time to comment. A real thin cabinet could possibly be opened with screwdriver. Our cabinets are made from that same thickness steel as many gun safes. We use the term “ultra light” when comparing to traditional safes. Our cabinet is 100lbs. The big difference is wight is drywall. The safe industry uses drywall to add weight to there cabinets. Their belief is that people think heavy safes are more secure then lighter safes. They are not. There are so many reasons not to store firearms with drywall. The safe industry does not care about guns, they care about selling safes. Are Agile cabinets are lighter, non-corrosive and easier to live with. We do recommend bolting cabinets to the floor or walls. The cabinet seems really cool but also a bit too small. I get you are going with lightweight, portable and all that. But if you need to buy 3 or 4 of these things for your needs I would need to dedicate a whole room to it. I only saw one size safe on your site. Did I miss anything or is it only the one size? Thanks for your comment. Our Model 52 cabinet was designed to hold up to six long guns but the louvered back panel allows for handguns to be stored in addition as well. We do offer larger steel gun cabinets that can be configured in a number of ways, depending on what your needs are. Those can be found on our site under “DOD Cabinets”. Are there any predrilled holes in the back panel to allow securing to wall? David, yes there are pre-punched hole in the back and sides to allow you to secure the cabinets to the wall, floor or each other. Hi, I’ve been looking for a safe that is appropriate size for a condo, but can also provide the strength as well. Moisture is a concern, and is there a light kit available. Just starting my research, so thanks for your time. We do not currently offer a light kit however you can use LED Light strips available in Amazon to easily light the cabinet. This is a peel and stick tape with LEDs. As far a moisture, the Agile cabinets are vented and will not retain moisture. If firearms are properly cleaned and oiled you should not have a problem. If using to a sealed type cabinet, just make sure to open the door every month or so. If using a safe with drywall, get a good dehumidifier, open the safe every month, and keep an eye on things. I would inspect and wipe down rifles every 3 months. We hopw to offer a light kit later this year. Can your Agile 52 be outfitted with a different lock such as the Safelogic Xtreme? Thank you for your comment. Outfitting the Agile 52 with a different lock is not something we’d recommend doing. If you had any specific questions, though, let us know and we’ll get you in touch with the right people. So, what you are telling me is that the common gun safe is going to rust thru, from the inside out, from the chemicals. This whole article is BS. After over 30 years of owning and using multiple gun safes by various manufacturers, I can tell you that the only problem you have in a Gun Safe, is the build up of condensation, from cooling and heating. A simple electric dehumidifier cures that problem. Without it, you will see mold and mildew for on guns and leather straps, as well as surface rust on unprotected firearms. The author here, is a salesman, selling safes. Thank you for your comment and feedback. It’s great to hear that in your 30 years of owning gun safes that you haven’t had to experience this sort of issue. We do, however, see the topic of corrosion as a serious problem with many gun safes and cabinets on the market. Simply put, a gun safe should not create an environment where any kind of mold, mildew, or rust occurs. The integrity of a firearm should not be at risk when placed inside of a gun safe or cabinet. We stand firmly in this belief. Also, please understand that our website holds comments to prevent spam and comment abuse. This is a common function many websites utilize. We welcome all feedback whether it’s positive or negative. If there is something we can do better, we’ll work to improve. If there’s something we’re doing that people enjoy, we’ll do more of that. Please feel welcome to reach out at any time. We’re happy to engage. THANKS FOR THE EXCELLENT INFORMATION ON (SAFE’S)!! HA! I see you are screening the posts, and my post I just posted, which exposes your shenanigans, will be stricken, I am sure. Have you ever heard the word “ethics”, well, as you are a salesman, probably not. You said it brother! Same with my Liberty safe. When building a gun room, what would you use in place of drywall? My original thought was to use two layers of drywall with a steel mesh in between them. I’ve had only one rifle rust in my Liberty Franklin safe and it went back to the manufacturer for a brand new finish. Other than that one rifle, no exterior or bore rust on any other firearm in the safe. This “the sky is falling” mentality is exactly what entices people into buying products that simply aren’t needed.